A Declaration of State Sovereignty was passed on June 12, 1990, making Russia independent from the Soviet Union. Since then on this date Russia Day has been celebrated, and this year Russians enjoy a three-day weekend from June 10 to June 12. If you’re in Moscow there are many fun activities to mark this day. The Central Moscow Hippodrome hosts races the entire day on June 10. This high-society sporting event brings out the head of Gazprom and political bigwigs, including President Vladimir Putin. Yet, the event is surprisingly affordable and popular among city residents. The entrance fee is as low as $3 (200 rubles), but there is a separate entrance reserved for those ready to squander money, and dining options start from $100 (6,000 rubles) and more. The dress code harks to a bygone era, recommending ladies to wear hats and suits for gentlemen. The hippodrome invites guests to arrive at 11 a.m., and the races begin at noon. 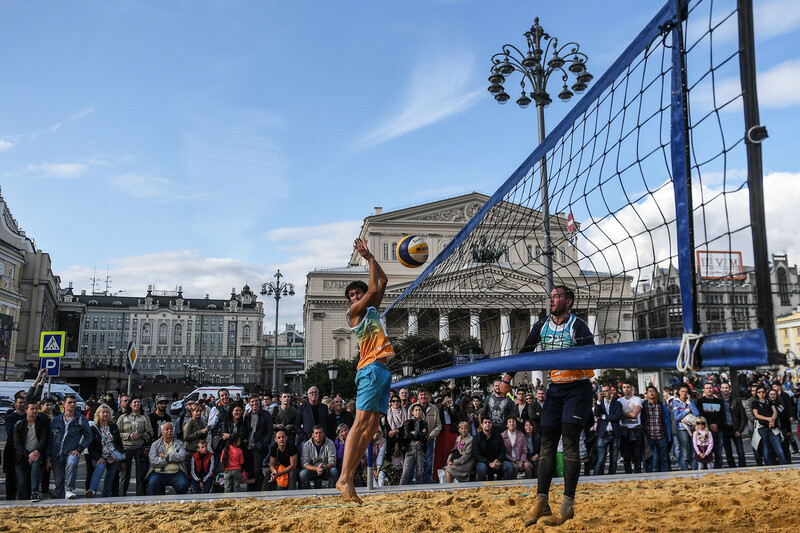 The city celebrates Russia Day by throwing a massive beach volleyball party. On June 11-12 fans are welcome to show their skill in pitches filled with beach sand that are set up next to Manege and Revolution squares. Everyone is welcome, both teams and individual players. The city designates professional referees to observe all games, and many other activities in the city center are free of charge. A pitch for beach soccer will be set up in Victory Park on the same dates. The Run For Dogs race on June 11 is a charitable event aiming to help dog shelters, and entertain humans and their pets. The race is 5 km, but it’s meant to be an enjoyable way to spend time for a good cause. Dog owners can sign up by registering on the website (in Russian). Entry fee is $24 (1,500 rubles), and all money raised is donated to dog shelters. Runners without a pet can partner with those from shelters. The start is 11 a.m., and organizers begin distributing runner’s packages as early as 9 a.m.
Novy Arbat is a draw for comedians in Moscow. This Sunday, June 10, Stand-Up Club #1 will host a special comedy show that’ll subsequently be released as video clips. One of the organizers, Steve Foreman, is a famous radio host running the popular Capital FM 105.3 STAND UP show available on iTunes and SoundCloud. And his exclusive long set is on the menu on June 10 at Novy Arbat 21. The solemn citywide firework show on June 12 begins at 10 p.m. sharp. This is a longstanding tradition, and the fireworks start in various parts of the city: parks, the city center, and etc. 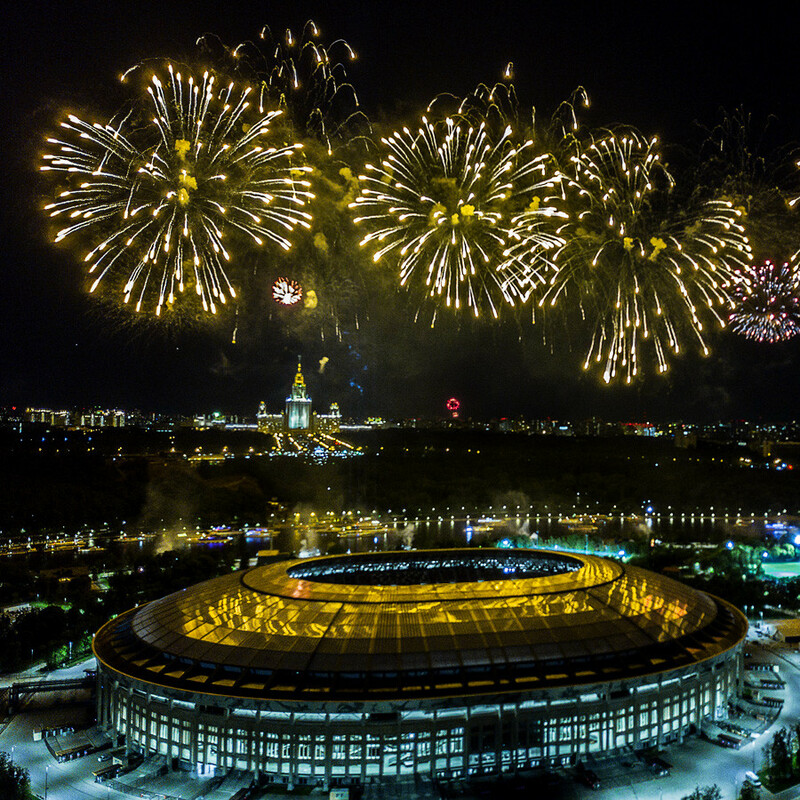 The best places from where to observe this massive firework show include Vorobyovy Gory, Poklonnaya Hill, Moskva River embankments and bridges (especially at Gorky Park). This is an inclusive event that does not require spending money, but if you’re willing to pay for an exclusive sneak peek into the firework show, consider buying a ticket for the Moscow City observation deck, or for one of the high-end restaurants with panoramic views of the capital. * This event was canceled due to technical problems on June 10, one day after the publication.